The Harbor Carriage is a deluxe, ground floor king room, furnished with a romantic period inspired, dramatic four-poster antique style king bed. With a private entrance, that is separate from the main Windward House Inn, this room is ideal for romantic getaways. 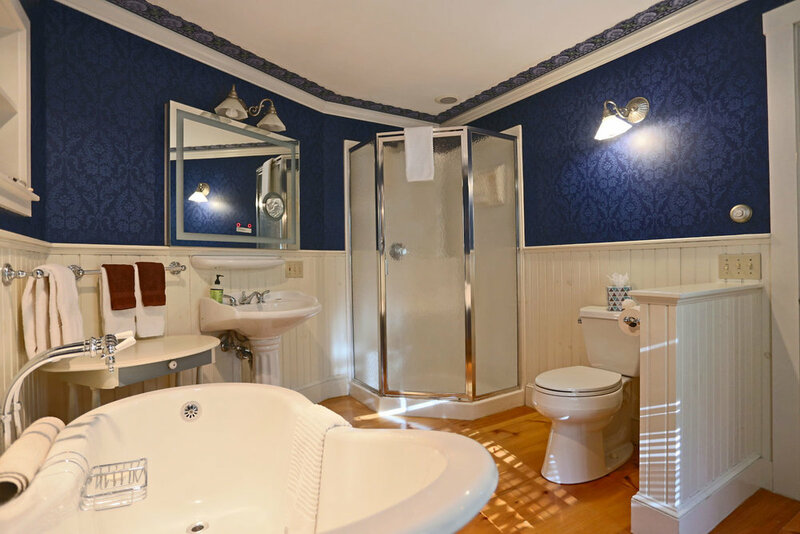 There is a refrigerator and beautiful blue gas fireplace that matches the vintage soaking tub in the en-suite. A unique feature of this room is the enormous en-suite bathroom, featuring it’s vintage high-back soaking claw-foot bathtub and separate walk-in shower. The Harbor Carriage gets its name from its own rich history. Within this section of the renovated post and beam barn, the original owners of this circa 1850s Greek revival home, kept their carriage.